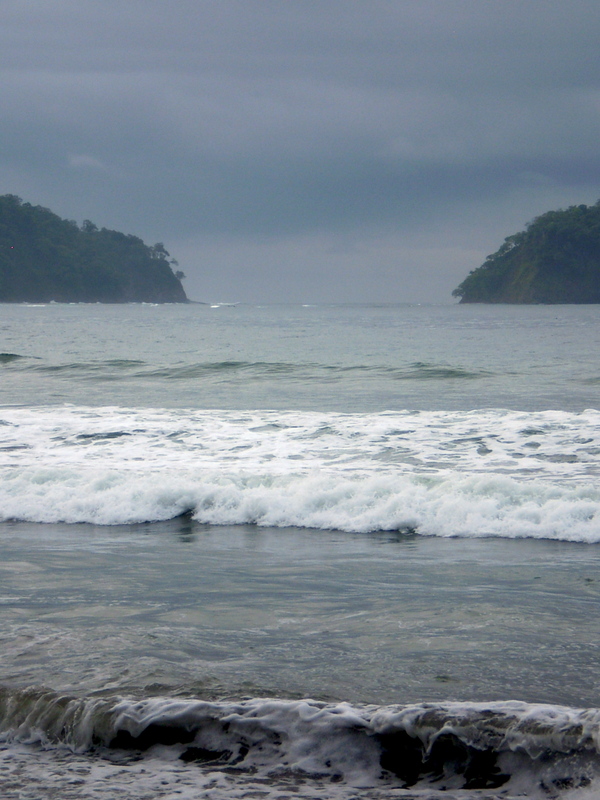 I might as well start it now … that li’l travel report from my trip to costa rica … while laundry is a-wash, plants have been watered, caffe’ be had … I shall take a bit of time to share some tales. 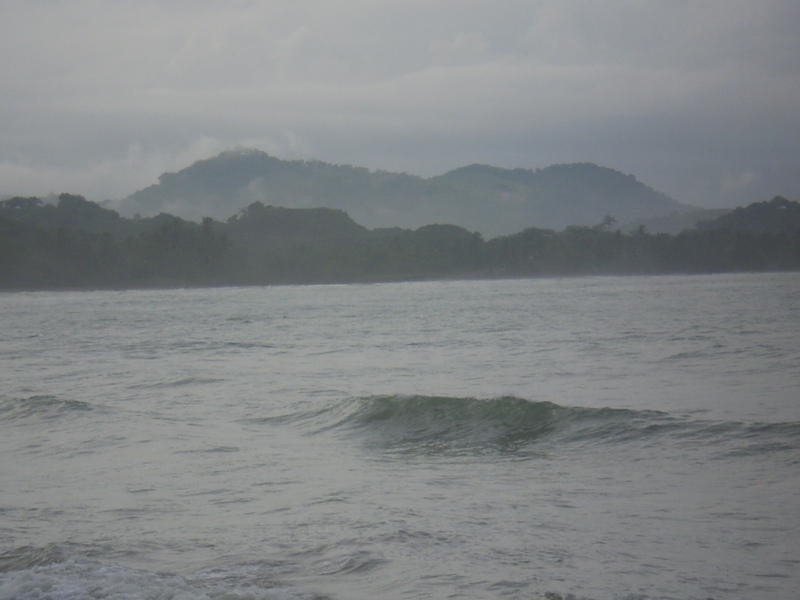 I had very little idea what i was getting into when booking the ticket TACA to Costa Rica via San Salvadore. had not even informed myself about the $$ – colones exchange rate and pesky details like that. also had no idea just how close it is to the equator. 9 degrees north. ahem … last time i was that far south was on Ceylon, lifetimes ago, as a teenager. All went very well – finish to start. With some curious detours though, and adventure of course. think: driving alone at night in the dark through the Cordellerias mountain range on a two-lane high-way in the middle of a fierce thunder storm with lightening bolt crashing in left and right. but at least those lightening flashes provided some ‘light’ …. as highways there are not actually well lit. lets just say: Nada. and did I mention that i had no clue where i was 90% of the time. Direction signs are far and in-between. general direction was San Jose’ / aeropuerto – but only rarely that showed up on roadsigns. I basically drove on 90% intuition. Also to mention are those huge camions (large trucks) which crawl up those slopes at about 5km an hour. what’s a girl to do? overtake them of course, never mind that it was dark and curvy … it was either that or arrive at the aeropuerto in about two days. i had skills i never thought iId possessed or dared to execute. come on!!! … overtaking a huge truck at night on a road i don’t know in a rain storm on an curvy mountain road … not exactly my usual M.O. i dare say. But of course i officially put a small army of guardian angels ‘on duty’ to make it through that one. and that was only one bit of a day that went rather different than anticipated. It was my last day (I know, i am writing this back-wards …) – and I had intended to visit the volcanos. But … surprise surprise, the car did not start. Was so grateful that this happened while i was at a safe place (my lodging) where I could retire into my room, switch on that AC and rest while waiting, and not during some jungle area in the heat during noon time. The climate was such at the time, especially just before some rain started, that the humidity increased a bit and the skin was slightly covered in … well, lets call it: dew. I loved this climate. the skin felt moist and soft, hair turned silky and curly. I looked entirely differently there … and not only because I had acquired my first tan in ages. But more of that one later. So, I waited for the car chap in comfort … but it delayed my departure. Which plugged me – once I finally got off the ground so to speak – into a major traffic jam aka mess. Even worse than those i had encountered in mother India. Luckily i had just been at a shell petrol station, been to the loo, had food with me … but ladies and gentlemen: 2.5hours for 4km ain’t fun sitting in the car, idling away while cars and trucks roaring besides you coming from the other direction. Heaven knows what that was about.some accident? or road construction? That same trip that took me only 4 hr three days prior … now took from 1:45 – 8:30pm. I suspect some bridgework caused the delay, reduced traffic to one lane. That’s why i ended up driving in the night in the thunder rain storm through the mountains. Of course i had some well chosen choice words for the chap at the rental car company once I arrived. But won’t spent time on repeating those here. that’s a battle to be continued via e-mail and credit card companies and the director of that outfit. Luckily I had by then reserved a li’l place near the airport. A B&B which I had found it on the internet … price seemed decent … so, there I went. A shuttle took me there. Turned out it was a small B&B, with mum, dad and adult son sitting on the porch waiting for me to arrive. Which I finally did, around 9pm or later. can’t remember. I do remember that I had no dinner … except some hot milk to which I added ghee, cardamom and saffron. That’s always my emergency dinner and it works to carry me through the night. The room was tiny, of sort. but tiled and clean, wooden ceiling. were just rooms next to each other, motel style. with banana trees/plants right in front of the door. but i couldn’t see that much … being night time and all. Fuddled around w/ the luggage, then off to bed. somewhere near by must have been a discotheque or something … and that being Friday night, i was not surprised to feel that music, not so much hear it. but it had that very strange feeling of “bass” stumping through the grounds … most odd. Took an extra dose of liquid melatonin and thought that would be it … but no such luck … – I heard those creaking wooden door sounds and noises … most unsettling. But I looked, nothing looked odd. Okay, back under covers. Then i felt something crawling across my face … i killed it of course, whatever it was … but it did NOT help to calm me nerves. Back in the silence i heard those Creakingwoodendoornoises again … MEGA creepy. Okay, that’s took the bisquit. If it’s true that i had by stroke of fate checked into the costa rican version of the Bates Motel, … i won’t be found half-naked, dressed in a silent-film area nighty on my bed … oh no, i shall be fully dressed … in case i would need to escape from whatever i was paranoid about. I learned many things that day, one of which that I realized that i had clearly watched too many Hitchcock films far too often !!! So I got up again, got dressed, pants, socks and all … and went back to bed. prepared for battle! But I simply fell asleep and the next day my clothes looked like … well, like I slept in them. Mother bates was still alive, and brought me caffe’ … and sonny-boy also looked more harmless in daylight. Dad was not to be seen …. heaven knows what happened to him??!! Had breakfast … toast and two fried eggs. Sitting near those banana trees and other tropical plants. spiders included. I believe i have seriously overdosed on fried eggs during that vacation. but rice and beans for breakfast is simply not my cup of tea. Caffe’ is great … and the fruits as well. Western style food is PRICEY …. but really, rice and beans have only certain appeal for me. I admit, i did not check that price-tag and I was famished. But I did have yummy foods – got lucky in finding simple and good places. even mozzarella panini with chicken. The greenery .. so lush, so abundant (so full of mosquitos — those were the big MINUS for me. they simply love me too much. and nothing much i can do. i use repellent … but they don’t seem to be impressed. even got stung through my socks. the people I’ve encountered were lovely …. i called it a warm heart. my Spanish has improved … even managed to chat w/ a woman on the bus for abut 45 min flat. whoa … who would have thought i have enough Spanish in me for 45 min chatting?? She was a beautiful woman … 41 years … and a grandmother of two. Had four girls, the eldest had her own child about 3 years ago. i.e. she became abuela with 38! That struck me a lot … 16 year old mums … quite accepted/normal. But my jaw dropped on few occasions in that regard. apparently women earn about 1/3 of that what men make … (yup, you’ve read that right) and, the men earn not much either of course. Well friends, I could of course write mucho mucho more … but then i’d be here for hours on end. We had a lovely lovely time. Was VERY lazy, one could say. watched the waves for hours, walked along the beach back and forth. Even managed to get sunburned while sitting in the shade AND using sun-lotion AND wearing a hat. felt like a (human) shade-grown coffee plant … I never sat in the sun … still eludes me when and how I got that red belly. Must have been while standing in the ocean waves … that was the only time when I was not in the shade. The water was great … enjoyed it a lot. got one good tumble by one wave I entered a tad too late. even suppose I might have gotten a mini-whip-lash. dunno …. I got up early in the mornings … before 6 mostly. prepared some hot milk etc … and took it in a cup to the beach, had the milk and some cookies … and just loved being there. Sat a lot at those benches at a surf school. run by some gringo named charlie. they let me sit there … even though i never purchased on bit of their surf services. I actually considered to learn to surf … for about 4 seconds. And even thought about kajak-ing to that island … considered that for about 10 seconds. But then got wise and thought i might attempt it on another trip when my strength is much … well … stronger. 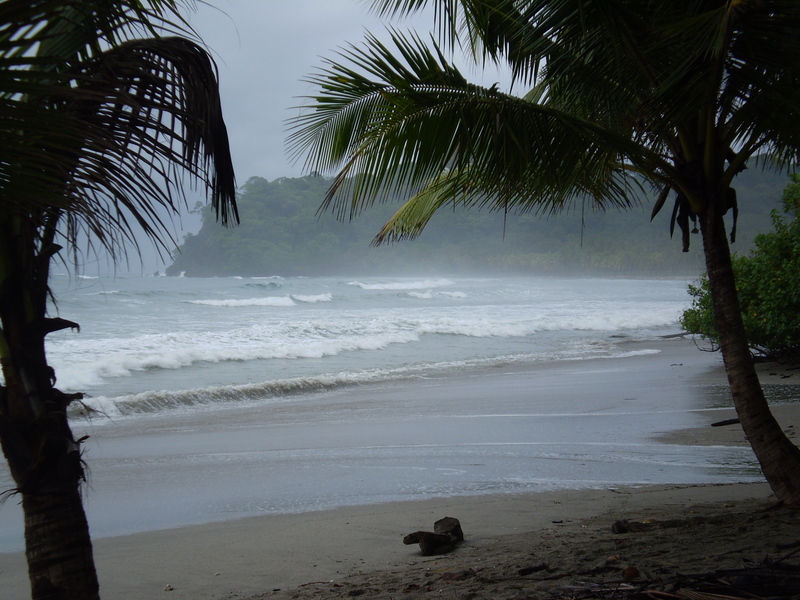 I am pretty sure i will return to Costa Rica. the flight and all that went smooth. the whole trip was blessed, so it felt at least to me. Visiting my friend in the central valley – coffee growing area was lovely too … she retired there – purchased a nice plot of land in the green hills … and now adjust to la vida pura. or pura vida. I had actually planned to stay with her a bit longer, but alas, the draw or pull for the beach won out and i rented that car and took off to the beach again. well, and the rest is history (see above). But I also use public busses quite a bit. Maybe next time i will manage to view the volcanoes and other interesting places. but for this time …this was perfect. I managed to read TWO book. Marie-Louise von Franz and an astrology book. – that was a major accomplishment … wrote ZERO postcards … checked e-mails twice perhaps. yes, i was that on relax mode. at least for me …I enjoyed not needing to do anything … just flow with how things came and went along. We might and hopefully see each other soon … or talk on the phone. Best wishes and thanks for your time reading this rambling … while not even being back for 24 hr. Oh … btw … the birthday was equally low key and wonderful. did not tell anyone about it … just lived the day and felt so blessed being there in the midst of that beauty. Samara felt very soothing to me … calming. “We live by mystery, and not by explanation”. THIS could be my new tag-line….